Interested in adding Patriot products to your store front and/or website? Let us know! We are always excited about new dealer opportunities. Whether you’ve been in the marine industry for a long time or you’re just getting started, we can work with you to get the right program in place. Unlike the other major manufacturer’s, we tailor fit a dealer program to compliment your existing business! 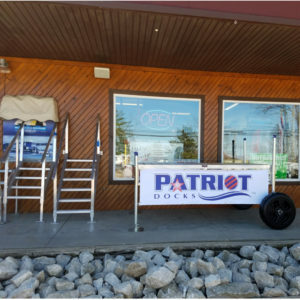 As part of the Patriot dealer network, you will have access to exclusive pricing on our catalog of truss docks, boat lifts and accessories. You will also have the support of our professional staff to answer any questions and offer suggestions.